more over I registered my application before also my access_token it is by write permission value. dose some body have any idea? You have to create a post describing your application, and edit it into your application's registration. Basically, the first arrow needs a value; and you can set it when you edit (with the second arrow). 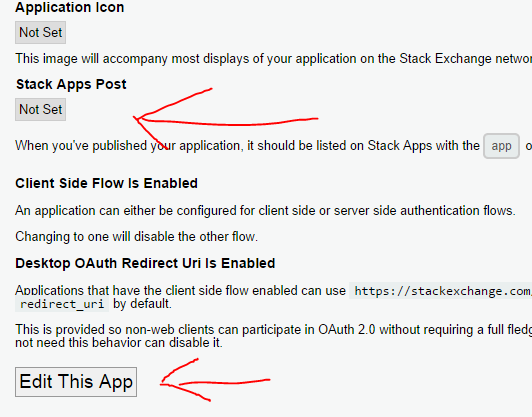 Click "Manage your applications" in the homepage sidebar of Stack Apps to get to your application list. Not the answer you're looking for? Browse other questions tagged support api-v2 c# write-access . Abuse potential in API write-access? Google App Engine [app]s - We are all on the same quota! Do the terms “key” and “access_token” refer to the same thing? Why is “body” missing from certain inbox items? Why is the API giving a different response for preview true/false with POST requests?